This is the work of a legendary New York photographer and an inside look at the film that documented fragments of his life and those of history. 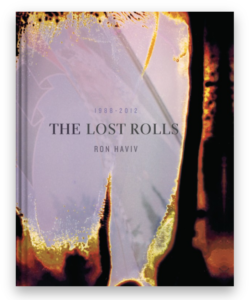 The Lost Rolls: 1988–2012 collects unused pictures from the photojournalist Ron Haviv, depriving them of context and giving them a strange new beauty. What emerges from The Lost Rolls, a forgotten and neglected chronicle, salvaged and brought back into the light, is a different way of looking at photographs, one that relies less on scanning for information and context, but rather delves into competing layers of temporality and paradox: the immediacy of the past and the distance of the present. This book will make you want to develop your forgotten rolls of film. The magical photos recovered from over 200 lost rolls of film… An odd family photo album in which the kin are the people and places that have defined global politics and culture in the past quarter century. These photographs are now objects of art and make up an exhibition, which is not so much about photojournalism, but is a lament to the era of film and investigation into the interaction between photography and memory.